KOKOMO, Ind. — In the competitive job market for teachers, Tyler Keck stands out from the crowd. 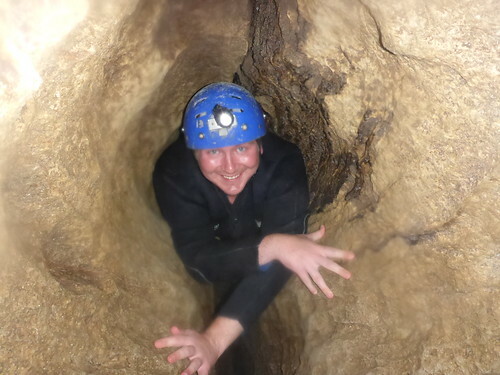 John Williams navigates through a cave while in New Zealand. The recent Indiana University Kokomo graduate will teach fifth graders at Kokomo's Lafayette Park Elementary International School this fall, and said his experience student teaching in New Zealand gave him something unique to add to his résumé. "This experience in New Zealand helped me immensely when I started applying for teaching jobs," he said. "I want to educate on a global level in my classroom, so to have the opportunity to travel around the world and bring back my experiences to the international school is something I find very exciting." Keck, from Kokomo, is one of the first three School of Education students in an overseas student teaching program started by Dean Paul Paese, and offered in collaboration with IU's Global Gateway for Teachers. Ashley Spraker and John Williams also completed their student teaching in Auckland, New Zealand. Spraker, from Cutler, also has a job for the fall, teaching fifth graders in Brownsburg. She said school officials were very interested in her overseas experience. "It definitely piqued my interviewer's interest, and I was asked questions about it during my interview," she said. "It was certainly a good conversation point in this process, and showed my willingness to go the extra mile for my profession." Fairmount resident Williams has just started his job search, and said he grew as a teacher from his experience in New Zealand. "I had four wonderful cooperating teachers, who taught me a ton about what to do and, more importantly, what not to do in the classroom," he said. "They were extremely informative, and even more supportive." Paese said the three gained more than just classroom teaching experience. "Not only did they come home with new ideas for their classrooms, but they have a better understanding of the world and themselves," he said. "When you step out of things you are familiar with and learn new things, you get a better understanding and appreciation of what you are used to." He anticipates placing three or four more IU Kokomo student teachers overseas next spring, possibly near Dublin, Ireland. Spraker had a multicultural experience at an elementary school, with a supervising teacher who is Maori, the first settlers in New Zealand, and a student body that represented 39 countries. "Going there allowed me to see how other cultures view education," she said. "I gathered ideas I hadn't seen in the U.S. that I believe will be beneficial. It also helped me see many wonderful aspects of America's education system that I hadn't previously noticed." Williams enjoyed the relaxed environment at his placement, teaching secondary English. "I loved the way the school day was set up, with classes rotating from day to day, and two tea breaks instead of a lunch," he said. "Many students walked around campus between classes playing a ukulele, a guitar, or some other form of instrument. Everything was much more laid back and relaxed, which created a great learning environment." All three student teachers lived with host families, building personal connections, Keck said. He also enjoyed visiting several public and private schools. He noted that New Zealand is the outdoor sports capitol of the world, and they enjoyed visiting the beach, attending rugby matches, and two weeks of backpacking the country's south island. Williams said the scenery was awe-inspiring. "We went from town to town, staying at hostels, and meeting people from all over the world," he said. "We saw the most amazing landscaping in the world. I have no idea how many times we were driving around, and I caught myself saying, 'Wow.'" He recommends the overseas teaching experience to other future teachers. "There are not many things you can do that will give you the chance to grow as a person than living for an extended period of time in a foreign country," he said. "Studying overseas is such a valuable experience, and not just for the credits you earn, or what you learn. It's much more about what you get from the trip on a personal level. It can truly be a life-changing experience."